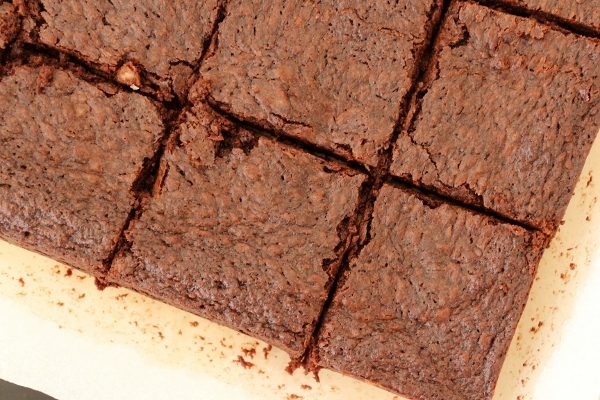 Homemade brownies are far and away better than their boxed counterparts. 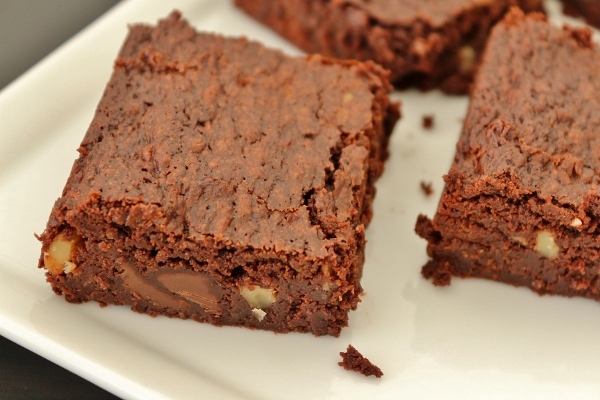 I know it can be tempting to grab a box of brownie mix from the supermarket because those photos and appetizing descriptions sound so tempting, but you can make brownies from scratch in little time, with minimal effort, and achieve outstanding results. I prefer baking brownies with real chocolate. There are decent recipes that use good quality cocoa powder, but I'm a firm believer in real chocolate in brownies. 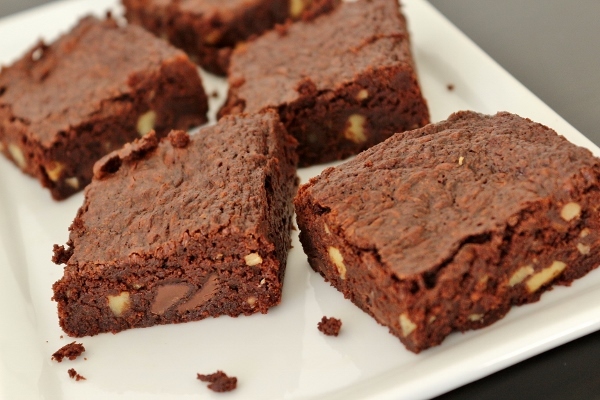 It's easy enough to chop up some chocolate and melt it together with butter to create the base of your brownies. Some eggs, sugar, and just a little bit of flour round out your basic recipe. I particularly enjoy the brownie recipe from The Back in the Day Bakery Cookbook. 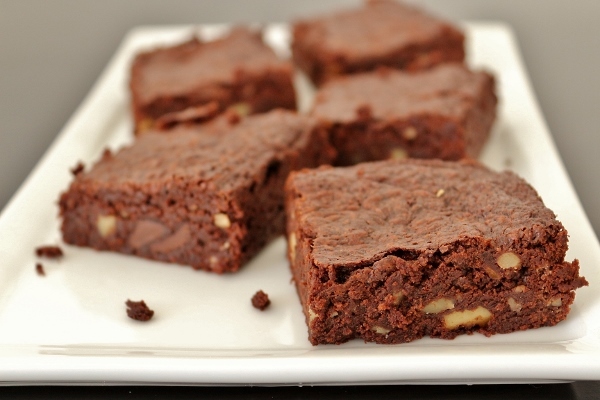 A tiny bit of leavening gives these brownies just a bit of lift, while the espresso powder and vanilla extract offer depth of flavor. A combination of chopped unsweetened chocolate and semisweet chocolate chips provide a rich chocolate flavor that isn't too sweet. 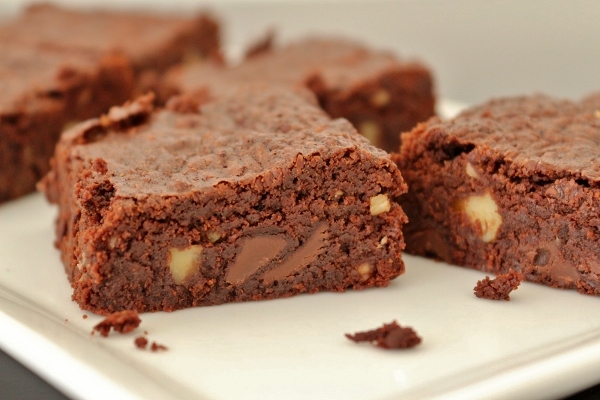 I've made these brownies with both chocolate chips and walnuts folded in at the end, and also with just walnuts (I ran out of chocolate chips one time), and both versions are excellent. 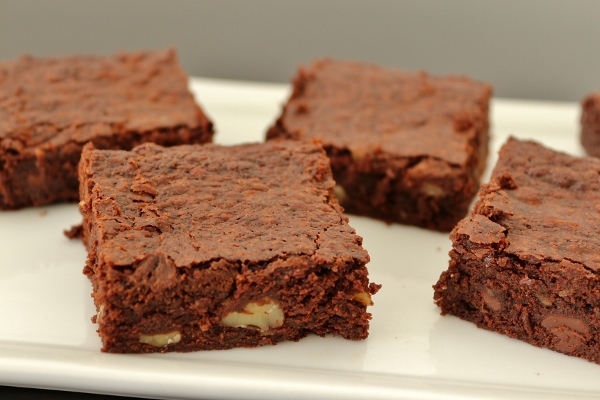 With a well-stocked pantry, you can make these brownies any time. I've baked a batch after work once to take to a friend's house for a weeknight dinner, and also baked them this past Saturday morning for my nephew's birthday party. 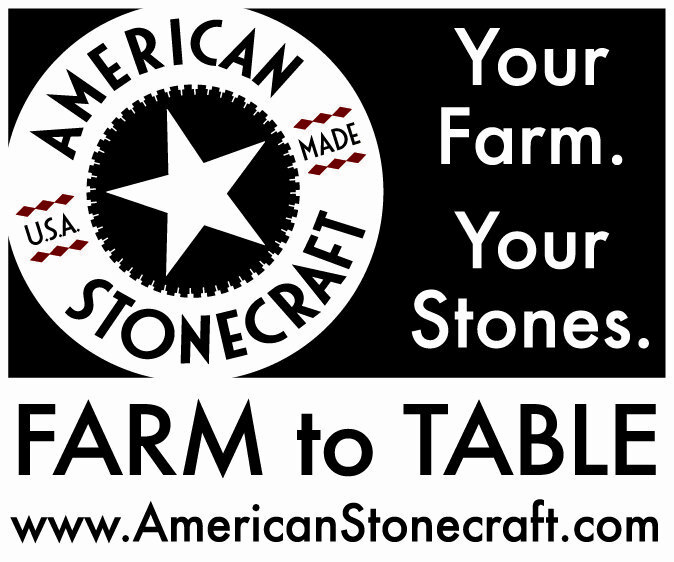 They are always a hit regardless of the occasion! 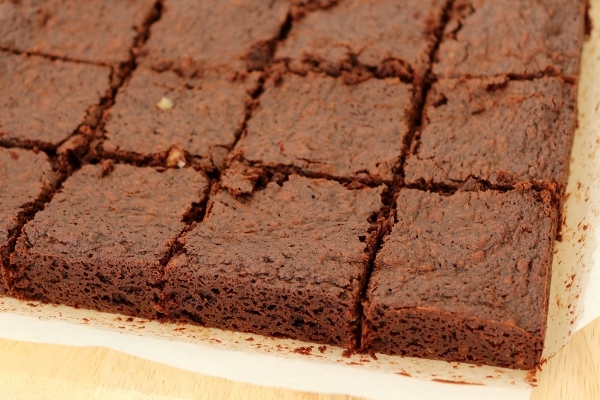 If you're looking for an excellent brownie recipe to return to over and over again, look no further. This is it. Position a rack in the middle of the oven and preheat the oven to 350°F. Lightly grease a 9-by-13-by-2-inch baking pan and line with parchment (I didn't bother greasing the pan first--the parchment is sufficient), allowing the ends of the paper to hang over two opposite edges of the pan. Whisk the flour and baking powder together in a small bowl and set aside. Put 1 cup of the chocolate chips, the unsweetened chocolate, and the butter in a large heatproof bowl, set it over a pot of barely simmering water (do not let the bottom of the bowl touch the water), and stir frequently until the chocolate and butter are melted and smooth. Remove from the heat. Meanwhile, in a medium bowl, whisk together the eggs, espresso powder, vanilla, and sugar until thoroughly combined. Add the egg mixture to the chocolate mixture and stir with a wooden spoon until the mixture thickens, 3 to 5 minutes. Sprinkle the flour mixture over the chocolate and mix it until combined. Stir in the walnuts and the remaining semisweet chocolate chips, mixing until just combined. Pour the batter into the prepared pan and smooth the top with a spatula. Tap the pan firmly on the kitchen counter to get rid of any air bubbles. Bake for 25 to 30 minutes. Let the brownies cool completely on a wire rack. 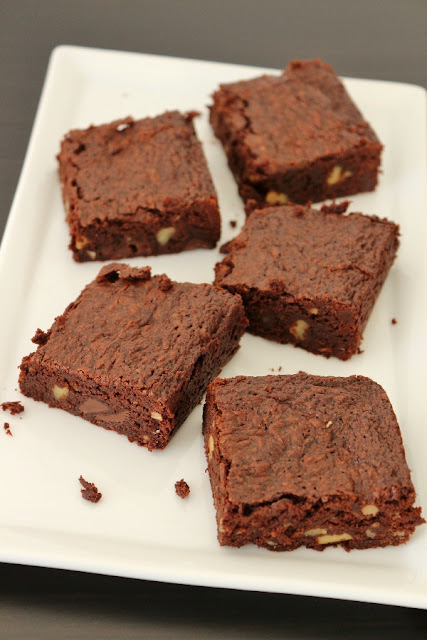 Cut the brownies into squares and enjoy. 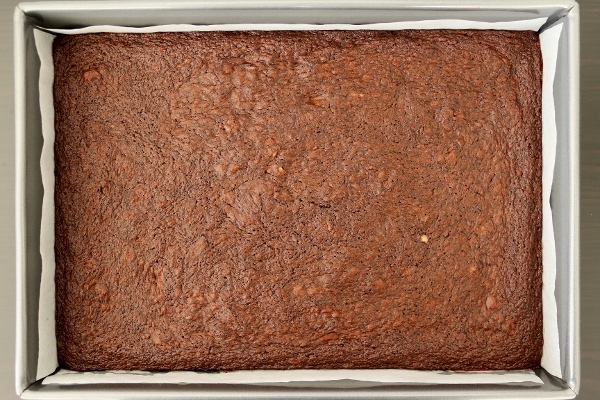 The brownies will keep in an airtight container at room temperature for up to 3 days.